Your school teachers probably encouraged you to plan your essays before writing them. Perhaps they taught you about outlining, showing you diagrams using boxes and a funnel, stressing the benefits of including a strong ‘topic sentence’ in each paragraph. Songs are like essays. They have a message, generally, that’s conveyed with a beginning, middle and end. There’s a sense of forward motion. As I write this, Katy Perry’s Last Friday Night is at number two on the Top 40 chart. While the general topic is partying, the underlying message is that the consequences of wild party behaviour are worth it, and that doing it all again next Friday is a foregone conclusion. Experienced songwriters know that having a message is absolutely key to the process of songwriting. In Nashville, some writers book three or more cowriting sessions a day; they won’t waste time working on an idea that doesn’t have enough potential for development. From the out- set, usually, there’s got to be a message. Let’s use another top-charting song, Dierks Bentley’s Am I the Only One, as a test case. Just look at that title. Get your songwriter brain think- ing. Ask yourself how the songwriter might potentially develop this idea, moving forward lyrically to the point where the idea in the title is expressed, “am I the only one?” Practice this when you see titles of songs you’ve not heard. Write down all the possible ways the title might be developed. Then make a map to see how the writers actually crafted the song, lyrically. 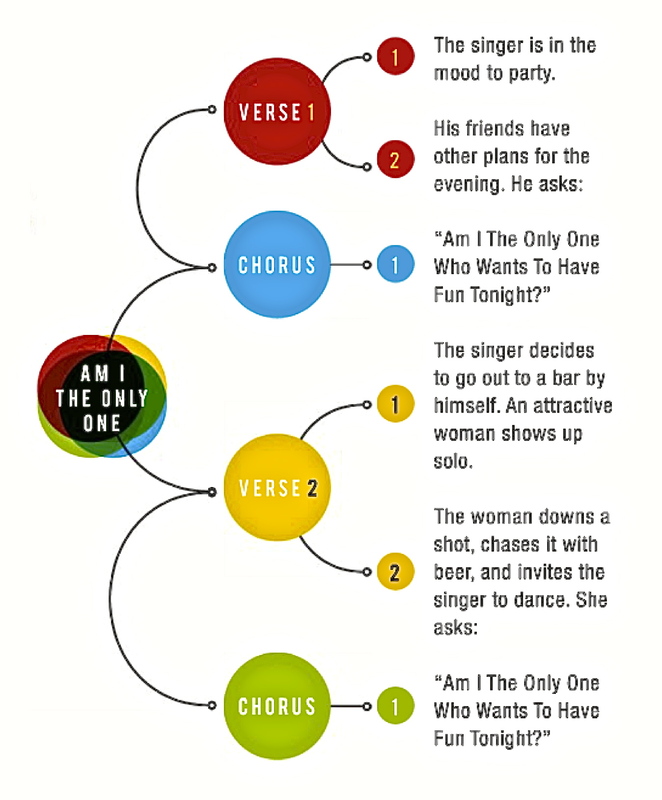 The Katy Perry song and the Dierks Bentley song both deal with the subject of partying, but each has a unique message to deliver. They use different techniques to create a sense of forward motion. Like a good essay or short story, they reach an emotional peak at about 7/8ths of the way through. They build to a high point where the message is crystal clear. Try mapping your latest song. What’s your topic? What’s your mes- sage? How have you developed the song from section to section so that it moves in a forward direction? Did you reach the highest emotional in- tensity about 7/8ths of the way through? Is it interesting enough that you could listen to it repeatedly? Even if you didn’t know what you wanted to say from the outset when you sat down to write, you can help ensure that you’ll deliver a clear message by mapping out your song. Debra Alexander is a veteran of the Nashville, New York, Austin, New England and Toronto music scenes. She cycles from Toronto to Mississauga to teach music theory and songwriting at Metalworks Institute. Really liked this exposé. I just started investigating songwriting and this is very refreshing.